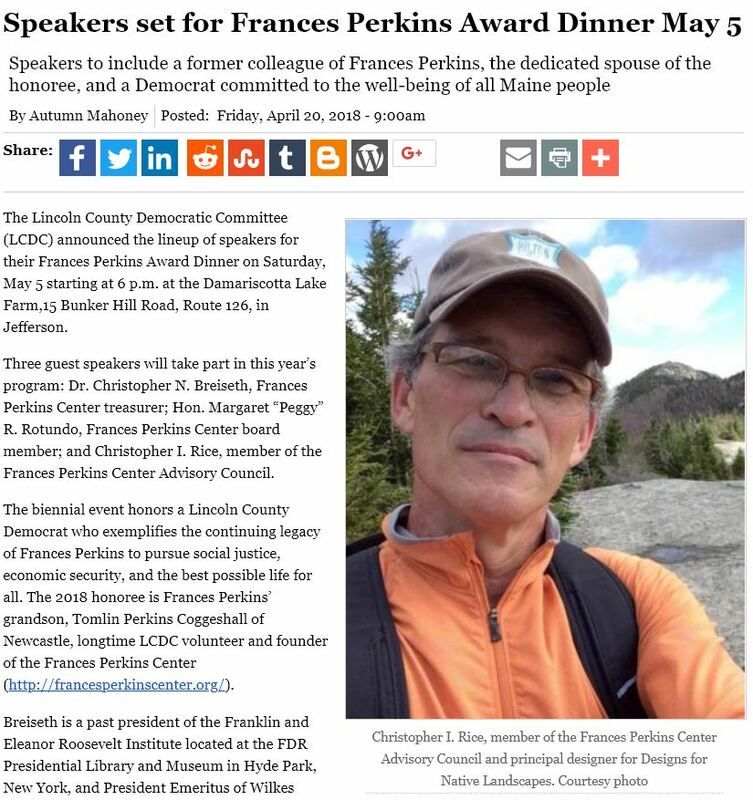 The Lincoln County Democratic Committee (LCDC) announced the lineup of speakers for their Frances Perkins Award Dinner on Saturday, May 5 starting at 6 p.m. at the Damariscotta Lake Farm,15 Bunker Hill Road, Route 126, in Jefferson. Three guest speakers will take part in this year’s program: Dr. Christopher N. Breiseth, Frances Perkins Center treasurer; Hon. Margaret “Peggy” R. Rotundo, Frances Perkins Center board member; and Christopher I. Rice, member of the Frances Perkins Center Advisory Council. 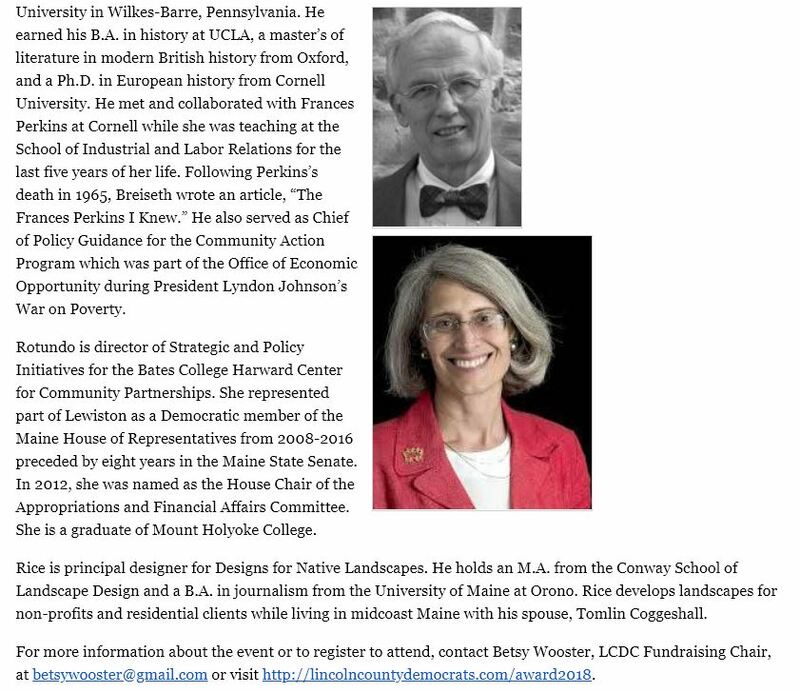 The biennial event honors a Lincoln County Democrat who exemplifies the continuing legacy of Frances Perkins to pursue social justice, economic security, and the best possible life for all. The 2018 honoree is Frances Perkins’ grandson, Tomlin Perkins Coggeshall of Newcastle, longtime LCDC volunteer and founder of the Frances Perkins Center (http://francesperkinscenter.org/). Breiseth is a past president of the Franklin and Eleanor Roosevelt Institute located at the FDR Presidential Library and Museum in Hyde Park, New York, and President Emeritus of Wilkes University in Wilkes-Barre, Pennsylvania. He earned his B.A. in history at UCLA, a master’s of literature in modern British history from Oxford, and a Ph.D. in European history from Cornell University. He met and collaborated with Frances Perkins at Cornell while she was teaching at the School of Industrial and Labor Relations for the last five years of her life. Following Perkins’s death in 1965, Breiseth wrote an article, “The Frances Perkins I Knew.” He also served as Chief of Policy Guidance for the Community Action Program which was part of the Office of Economic Opportunity during President Lyndon Johnson’s War on Poverty. Rotundo is director of Strategic and Policy Initiatives for the Bates College Harward Center for Community Partnerships. She represented part of Lewiston as a Democratic member of the Maine House of Representatives from 2008-2016 preceded by eight years in the Maine State Senate. In 2012, she was named as the House Chair of the Appropriations and Financial Affairs Committee. She is a graduate of Mount Holyoke College. Rice is principal designer for Designs for Native Landscapes. He holds an M.A. from the Conway School of Landscape Design and a B.A. in journalism from the University of Maine at Orono. Rice develops landscapes for non-profits and residential clients while living in midcoast Maine with his spouse, Tomlin Coggeshall.